Most of the photographs of signs that ‘friends’ send me or I have ‘snapped’ on my travels are from countries where English is probably not even a second language and where speakers of our (well my adopted) tongue twisting language try their very hardest to create a sign that is understood by the rest of the planet and of course fail. But even if those brave souls who spend such a long time scratching their heads trying as hard as the can to communicate in English fail surely there is no excuse for people who have spent their life speaking, and one hopes writing, English is there? 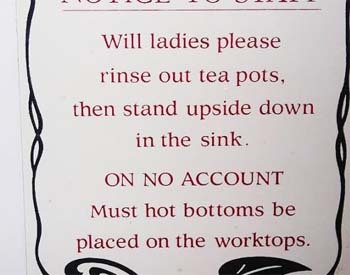 And with that question I bring you a photograph of a sign from a small village in England; mmh 1 out of ten and that mark was only awarded because the writer had remembered to bring paper! Of course the next picture is one, for me at least, to treasure! As an author I have always been interested in any place, house or indeed flat where there is a sign that says that the author of ‘Great Expectations’ and so many other wonderful books lived. And as someone who is that interested in old Charlie I am never disappointed because he was always one step ahead of the debtors and moved around an awful lot. 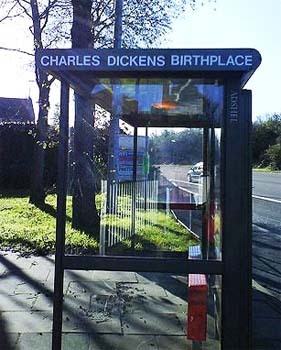 Still I had, until now of course, never seen his birthplace, no wonder Charlie wrote so eloquently about poverty, he was born at a bus stop! Knowing that explains a lot! 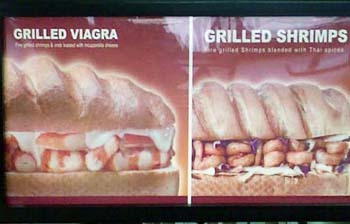 Today’s last and in my opinion oddest sign comes from the good people of Egypt where one feels that they don’t really know about Prawns and that in this Cat’s book is a crime and even putting aside what can only be described as the ‘peculiar’ sandwich on the right the one on the left look awful, those Prawns have never been shown a grill have they?